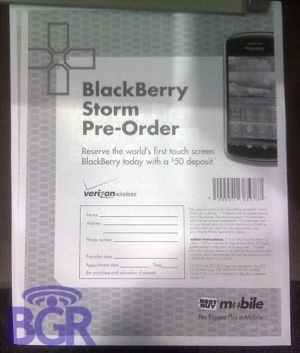 Best Buy to take pre-orders for the BlackBerry Storm | BlackBerry Blast! It looks like Verizon is not the only place to pick up a new BlackBerry Storm. BGR is reporting that Best Buy will be taking pre-orders for the new Storm. You'll need to put down a $50 refundable deposit but it will allow you to reserve a BlackBerry Storm that you'll get on launch day. There is no word yet on an exact launch date, but they should launch sometime in November, priced between $199.99 or $299.99 for a two-year new activation.